When I was younger, my mom lost me at the grocery store and had me paged over the store’s intercom. Did I mention that I was 15 at the time? It was mortifying. She also used to embarrass me with her overwhelming use of coupons. I distinctly remember a time the grocery store owed her money. To a teenager, there may be no greater humiliation. I share these anecdotes with you because similar situations were the storylines for recent episodes of The Goldbergs. The new ABC comedy is quickly shaping up to be one of the fall’s best new series. Told from the perspective of 11-year-old Adam (Sean Giambrone) and narrated by Patton Oswalt, The Goldbergs takes viewers back to the 80s and celebrates shoulder pads, Pac Man, big hair, and giant camcorders. A time before smart phones, Facebook pages and DVRs. But the series has more than just nostalgia going for it. Much like ABC’s excellent and underrated comedy The Middle, The Goldberg captures the innate hilarity and poignancy that come with day-to-day family life. The fact that it is based on executive producer Adam F. Goldberg’s real childhood – and several episodes are capped off with actual videos from his youth – makes the series that much more relatable. As I mentioned above, in two recent episodes, it felt like Goldberg may have been spying on my family when I was growing up. And did I mention that the show is funny? Laugh-out-loud funny. That, as comedies including Dads and The Millers have shown us this season, is not so easy to pull off. In between the guffaws are nuanced moments. Last week’s episode saw eldest daughter Erica (Hayley Orrantia) accuse her stay-at-home mother Beverly (Wendi McLendon-Covey) of never having a job. Beverly promptly went on strike and the show explored the intricate relationship between mothers and daughters both touchingly and amusingly. The performances are top notch. McLendon-Covey is giving a transcendent performance as the family matriarch. She should already be on people’s Emmy nomination ballots. And I’m particularly partial to middle brother (and perpetual underdog) Barry (Troy Gentile) and the Goldberg grandfather Pops (George Segal). Whether you’re currently a parent or were once a child (so pretty much everyone), The Goldbergs is the little jewel in the fall schedule you may have missed. I’m on a one woman campaign trying to get people to give this show a chance. Won’t you join me? A new episode airs tonight at 9 p.m. on ABC. Oh and if you’re going to buy something, check with me first. I probably have a coupon for it. That’s right. I’ve become my mother. Are you enjoying The Goldbergs as much as I am? What’s your new favorite show of the season? Talk about it below. I originally wrote this post for Antenna Free TV’s list of shows to binge watch over the holidays. Check out their complete list here. 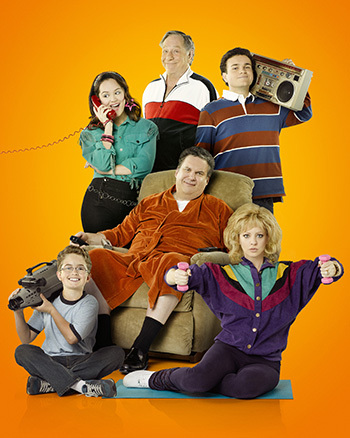 This entry was posted in New Shows, The Goldbergs, Uncategorized by TV Gal. Bookmark the permalink. I am usually in agreement with you on all things TV so maybe I’ll give it another try. I watched the first episode or two and found it a bit shrill.